Golden sponge covered with golden syrup sauce (42%). 100% natural flavours & no artificial colours. No hydrogenated fat. Suitable for vegetarians. 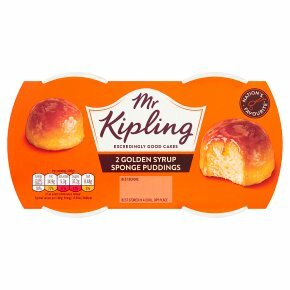 Nation's favourite* *Mr Kipling Sponge Pudding are the No.1 best selling ambient sponge puddings in Great Britain. Source: IRI Grocery Outlets Market Data from Great Britain 52 weeks up to & including 02.06.2018. All cooking appliances vary in performance, these are given as guide only.This product is not suitable for heating in a conventional oven. (Based on 800W (E) Oven).1) Heat each pudding individually.2) Remove seal, ensuring all film is removed.3) Place the pudding upside down on a small microwaveable plate and heat on full power for 30 seconds.We advise not to leave microwave unattended.4) Remove from the microwave gently and lift the pot away immediately to allow the sauce to flow properly.Caution: pot and contents will be very hot so we advise you use oven gloves or similar.5) Leave to stand for 1 minute before consuming.6) Do not reheat.Microwave ovens may vary in performance. The above is given as a guide only. Adjust times for other microwave ratings.